Today is Corey’s funeral service. I woke up sad, with leaky eyes, and feeling really a little insecure. It’s going to be a rough day. I will finish this blog after the services later today. Corey died last week of a drug overdose. He had just gotten out of rehab for alcoholism and his heart couldn’t take the strain when he used. It just exploded. He was too young, at 52, and he had had a rough time of it in life. Regardless, he was very loved and very loving. The world will miss his kind soul. Addiction is such a ruthless enemy and it’s killing so many good people here. I had a pretty good week. Spent a lot of time talking to my girlfriend and just chillin around the homestead. I got some mums and planted them in my flower boxes for the porch railings. I think I can mount them on the railings this afternoon when I return home. If not today, I always have tomorrow. I’ve been fighting my pain level pretty much all week. Especially in my shoulders and hands. Lately my hands are stiff and sore in the morning and it takes a little while and a lot of hand rubbing to make them work right. I’m sure it’s just age and some arthritis I am feeling, but it still is uncomfortable. I no longer take any pain medication, so it’s Tylenol or nothing. My neck / c-spine has been very painful too, and I’ve got lidocaine patches I have been using for that. The events of the past week here in the United State have been disturbing, to say the least, for everyone. I am having trouble even putting into words what it feels like to watch as our government defends racists, white supremacists, white nationalists, and the KKK. 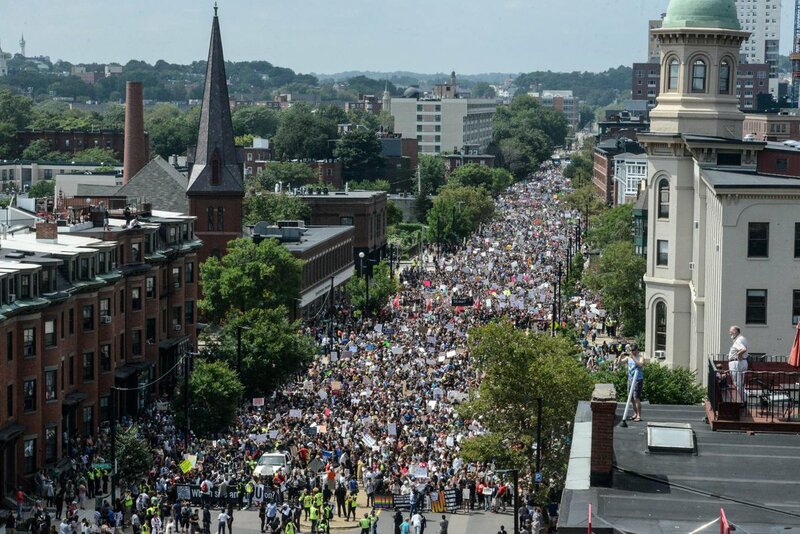 To hear our own President and other top political figures in his administration try to downplay the radical right marches and instead swing blame for disruption on the anti-hate protesters. Our “President” is even fueling hate between citizens and the police departments of major cities in this fight. He is causing great, great division here. Today I attended a family funeral which happened to be held at the same time and in the same neighborhood as our local march of solidarity in the fight against racism and the KKK. The protesters knew of the funeral and at my and his mother’s request were silently respectful as they passed our church where we were in the middle of the service. I appreciated this very much. While my heart was with the protesters I had to physically be with my family to show support and allegiance today. As I was riding home I did hear the comment “they should all be arrested” eek from my father’s lips. It was very difficult, but I managed to NOT freak out and say anything. I have to remember that my Dad is an older white man, who supports Trump and has always not cared for Liberals…it’s just his stodgy old way. I cannot change him, but I don’t have to “like” it either. His remark just shows me that the division being fueled by Trump and his hateful people has permeated deep into families and communities. I – like everyone else I just imagine – don’t know where this is all going to lead, or what the eventual outcome will be. I wish for PEACEFUL protests and resistance to the hate and intolerance of our “POTUS” and the hate groups. I realize that this is bound to just get worse before it gets any better. If history is repeating itself, we all know this is headed toward a huge showdown of sorts. Just when and where remains to be seen. Something major will happen, it will either divide us further or draw us closer. Let’s pray for the latter. Dear Mainely Butch, Please allow me to offer my condolences and respects for the passing of your beloved Corey. May he rest in peace and Bless his Spirit, and Bless your heart and all the hearts of all the Good Folk who love him. I’m sorry for you’d loss. Prayers are with you.